With an International airport and 29 nonstop airline markets on its daily schedule, Myrtle Beach, South Carolina, welcomes families from all over the world to its Grand Strand. There are 100 golf courses, Broadway-style entertainment, tons of shopping, and All-You-Can-Eat Buffets. One could say there is an activity within every square mile. But most people come for one attraction only. People fly from everywhere to dip their toes in the surf and have some fun in the sun. 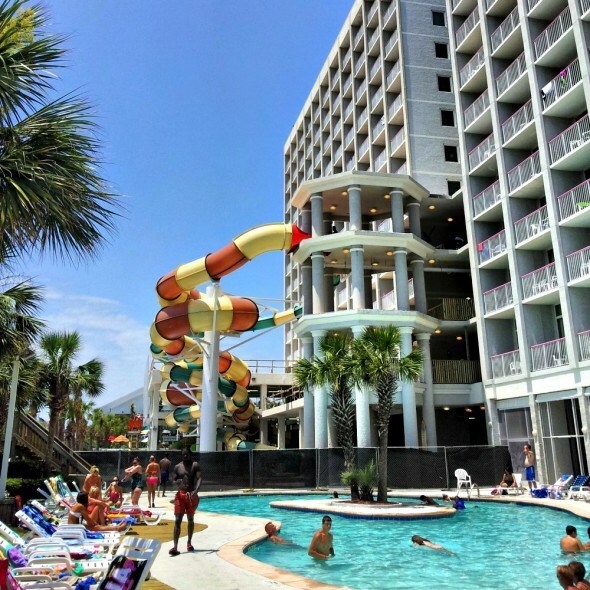 The Crown Reef Resort, one of the largest Myrtle Beach resorts with the most oceanfront rooms along the Grand Strand, is under new ownership after 20 years. The property has been undergoing a $7.5 million renovation since last fall with room upgrades and a new town center with a coffee shop, arcade, and oceanfront restaurant. However, the main attraction, which will set this resort apart from other family resorts, is a brand new $2 million water park. Skimbaco was invited to experience this brand new water park in action. With my being the closest to Myrtle Beach on the team, I took my two kids and the same family who accompanied me on a fun trip to Charlotte, N.C., last summer. Unfortunately, construction delays prevented the opening of the water park on our visit, but our kids still had fun with the lazy river, oceanfront pools, and beach. We had plenty to do. The two enclosed water slides launch from four stories high. It looks huge from the pool deck. The two-person “EXPLOSION” tube slide pumps more than 2,500 gallons of water per minute. “The ‘EXPLOSION’ is a two-person, serpentine-style ride with many left-to-right turns in 54-inch enclosed flumes,” said Nik Paas of ProSlide Technology Inc. 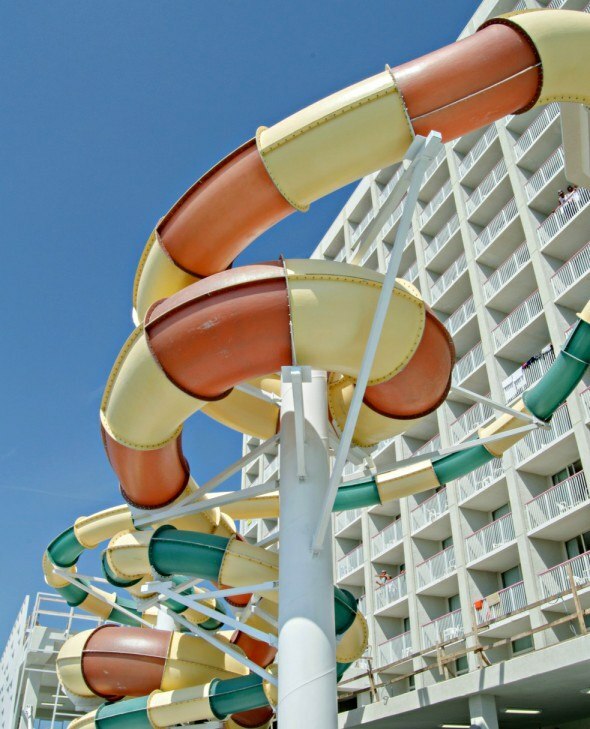 The second “TWISTER” slide, a one-person body slide, pumps 800 gallons of water per minute, while the “KIDZ Twister” slide sits 8 feet tall and 20 feet long. This water park will be enclosed in the winter and open year-round for all to enjoy. 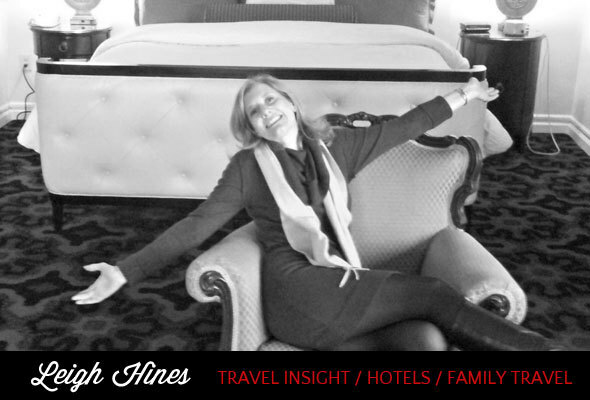 Room rates dip to less than $50 sometimes during the winter months, so talk about a bargain. Oceanfront resorts receive a lot of wear and tear through the years. The Crown Reef Resort has a 20-year history, and a lot of family memories have been made here. With three towers, and 514 oceanfront rooms, efficiencies, and suites, the new owners had a lot of work to do. They’ve done a good job for the price point. During the summer, an oceanfront room that sleeps eight with a full-kitchen is about $200 per night. Just to give you a comparison, a midscale to upper-midscale chain hotel down the street with a comparable layout is more than double the price, and it doesn’t have a new water park. Before the renovation, the rooms had peeling, dated wallpaper and kitchen appliances that had seen better days. Rooms now are more modern with new comfortable queen bedding, new TVs, new tables, couches ,lamps, freshly painted walls, and a kitchen with granite countertops. Artwork is coming to help give it a more residential feeling. As you know, money doesn’t grow on trees, so the flooring is the same in the rooms, and the dining room furniture remain the same from past renovations. The bathroom is small and still dated, but has a modern mirror and new shower curtain. It’s crowded for eight people to use, but families can do it. The rooms are not perfect with decor, and average at best, but from my perspective, the rooms are clean and nice for this price point in the Myrtle Beach area. 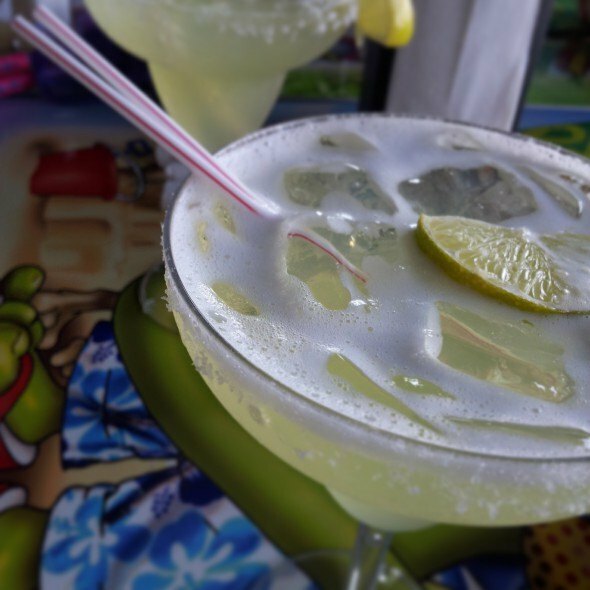 With an oceanfront restaurant, Loco Gecko, that serves good food, an arcade, a coffee shop, and ice cream shop, the new town center is fabulous. I was impressed with it. Prices at the restaurant are reasonable. Drinks are good, and it’s just fun to dine here by the ocean. This new town center is a fabulous addition to this resort and really helps take the vacation up a notch. There is also a live Fire and Hula show for families on Wednesday. The Crown Reef Resort also offers daily kid’s activities. Some things have a small fee; other events do not. The staff is friendly, and my daughter enjoyed having her hair braided. I think this is something that kids will enjoy in between swimming and the waterpark. The resort was still putting the finishing touches on the brand new Tiki Bar and pool-side dining feature, so this amenity was not open yet when we visited. 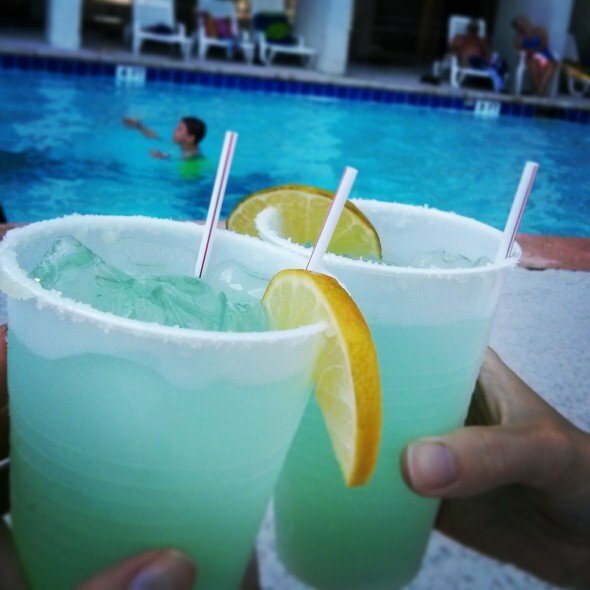 We brought a few drinks down from Loco Gecko to the pool to enjoy, and staff sold some drinks and frozen ice poolside. I think this will be a really good addition to the pool area. Our kids loved the lazy river and the pools. All in all, the Crown Reef is an affordable family resort where kids can be kids. For more information on the Crown Reef Resort and rates, visit the resort’s website. 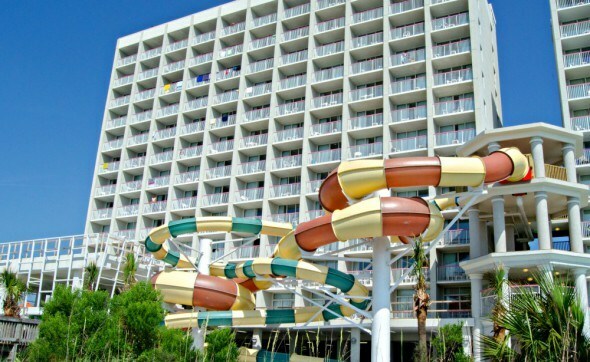 Crown Reef is a member of Vacation Myrtle Beach, a collection of affordable family vacation properties. This story was made possible by a media visit.